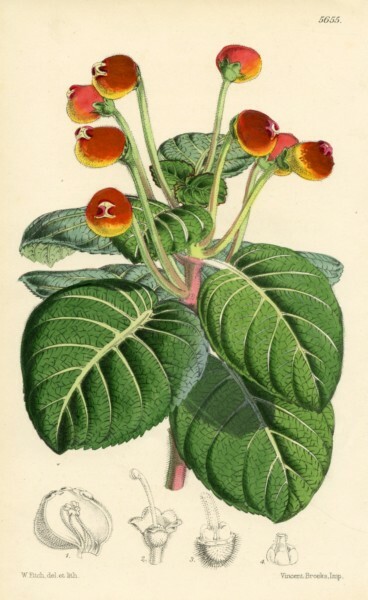 This was the illustration associated with the first publication of what we now know as Pearcea hypocyrtiflora. The variant most commonly seen in cultivation has darker more colorful foliage, although it is reported that both the green-leaf and the dark-leaf form occur together in natural populations. Note the accurate representation of the folded-over lobes on the flowers, covering the opening, as well as flowers with the lobes retracted allowing access to the flower. The lobes only open on plants grown in optimal conditions, which can be difficult to achieve in cultivation.